I was tired, I needed some rest, I fancied a quite break – a chance to get away from the hustle and bustle of living and working in Hove and Westminster. So why on Earth did I then go to see Iron Maiden with 56,000 lager-fuelled Vikings in Gothenburg, Sweden? Well, firstly I love the band, secondly I wanted to see Sweden and thirdly I had a free backstage concert ticket! The flights (return) cost £77 and the excellent twin room cost £58 per night. We flew from Gatwick to Gothenburg’s City airport which misleadingly turned out to be quite far from the actual city. Gothenburg, or Gotenborg as the Vikings say, is completely surrounded by miles of unbroken pine forests as I saw from the plane window. The lack of a need to develop such land is easily explained by the area of Sweden compared to the population (twice the area of the UK with one sixth of the population). The tall and ugly but useful ‘Lipstick Tower’ (nickname) is a great place from which to take aerial photos of the city. I was expecting to find lots of cobbled and quaint Amsterdam-style narrow lanes but in fact found quite the opposite. The main roads are massively wide which I imagine ties in with the lack of demand for development generally. The average avenue has wide pavements, cycle lanes, four car lanes, tram lanes and a canal! This means that the buildings are often quite far apart which was easy to notice from the top of the city’s tallest building. The centre of Gothenburg is made up of poorly designed 80’s terraces and decent old buildings are certainly rare. Strangely, most of the older terraced buildings that I looked at had an interesting structural problem in common – large vertical cracks running down the attached sides. My favourite building is certainly the imposing art museum with modern art fountain (pictured) which resembles the base of a New York skyscraper. Iron Maiden (or Maiden Voyage as my nan calls them), were amazing and the friendly Swedes were impressively dedicated fans, knowing all of the words to even the oldest and most obscure songs. Overall, I was not impressed by the buildings though. There was too much concrete and not enough heritage. 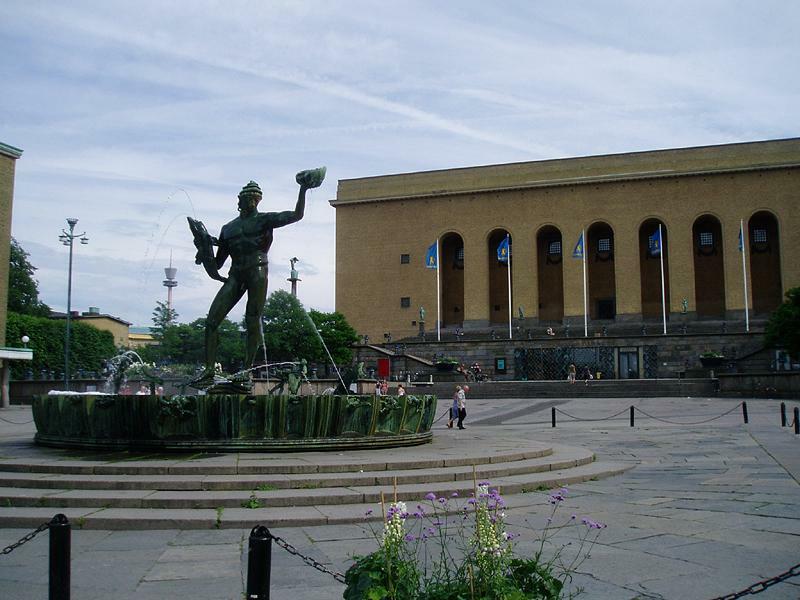 Gothenburg’s central station is Sweden’s oldest so there is some history but, on the whole, utilitarian development has triumphed.